Werner's Cairns blog: An Australian Migrant Story. This is the first time this story is published. I have asked our local daily "The Cairns Post" many times over the years to publish this or other stories from me, (Mind you I didn't want money for it) but they just were not interested. The year: 1958. I formed some wonderful friendships with Australians in this club and, I experienced the true blue Australian spirit over and over again as many times before. There was no malice shown towards me, considering that only a few short years before I would have been considered their enemy. And, amazingly, as a “former enemy” I was able to bring about a change in a longstanding Army directive that existed since the colonial days when the British were in charge here. When we first arrived in Australia the government under Prime Minister Robert Menzies, asked “New Australians,” as we were called then, to assimilate with Australians and integrate into the Australian way of life - and that was exactly what we set out to do. We never sought out German migrants, but mixed with Australians at every opportunity. 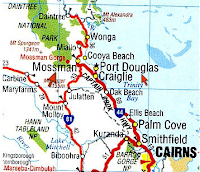 I joined the Mossman Rifle Club, which was located halfway between Mossman and Port Douglas, (See map at the bottom) and there I formed some wonderful friendships. People from all walks of life belonged to the rifle club, including Neville Rex, whose father lent his name to the Rex Highway, and from the four policemen stationed at Mossman; three were members of the club. After the shoot we had a few beers together and discussed shooting or other subjects and I had a wonderful rapport with everyone. The club visited other rifle clubs on a regular basis, in Cairns, Mareeba, Atherton, and Ravenshoe. To drive the entire length of the Rex Highway to Mareeba was an absolute nightmare; it was a narrow and dusty road, stretches of which had a high ridge in the middle, and made overtaking very precarious. All rifle clubs in Australia were under the jurisdiction and control of the Australian Army, and membership lists had to be submitted to the Army headquarters and kept on file there. What nobody knew, was that an Army regulation existed; stipulating that only Australians or British subjects were allowed to be members of rifle clubs and own a rifle. When my application to become a member of the rifle club finally arrived in the army headquarters in Brisbane, my name and other relevant information came to the notice of the Australian Army, and alarm bells rang. The name, Werner Schmidlin, just didn’t look too British or Australian to the top army brass. It was clear to them that I fell into the category of ‘foreigner’. The Army informed the club about the situation, and as I learned later, the club executive mulled over it for quite some time. However, they were not sure how to solve the situation or break the news to me. Apparently, no club had been confronted with such dilemma before. This certainly caused a predicament for them and they didn’t have the heart to tell me about it, nor did they want to lose me as a member. So it was decided to do nothing about it, or mention anything about it to anyone; let alone to me and they just let me carry on as usual and as a normal member of the club. All went well until we were practicing for an up-coming prize shooting event at Atherton in which I achieved an extremely good score. It suddenly occurred to somebody that the club could be in a bit of a predicament should I win a prize or prizes, and alarm bells started to ring. The Club executive had an “emergency” executive meeting in the clubhouse while I was lying on the rifle mount firing at the target. They finally had to own up and tell me about the Army regulation. To make a long story short, it was decided that, should I be successful in winning a prize or prizes, I will forfeit them to the shooter with the next best score, as the Army always had to be informed who the winners were in the shooting competitions. I was not upset about this situation; I realised that rules are rules, and was happy that the other members stood by me. The camaraderie was excellent; I was considered one of them, despite being on the other side of the fence during the war, then, only few years back. On the way home to Miallo however, I gave this matter a bit more thought and it started to rankle me. “Hang on a minute, I said to myself, "The Australian Government, since the day they accepted my application to migrate to Australia, back in Germany, had drummed into us migrants that we should make an effort to assimilate and integrate into the community of our new country and the Australian way of life. With this in mind and not being the person who lets unresolved matters stay unresolved, I wrote a letter to the Prime Minister, Bob Menzies. I explained the situation to him and pointed out that I wanted to practice what the Australian Government had preached to me – namely, to assimilate into the Australian community. I went on to lament the fact that, the Army regulation about "foreign" shooters was not in the best interest or spirit of assimilation and integration between Australians and New Australians, and so on. I also made it clear to the Prime Minister, that his government should practice what it preaches. Within a very short time I had a reply from the Prime Minister, Bob Menzies, thanking me for my letter, and stating that he had noted the content of the letter and that he would look into the matter, but will also pass on the letter to the minister of the army, Mr. Kramer. After approximately two months, the Army informed the club that the ‘vexatious’ rule had been removed from the Army’s regulations. When the club captain informed me about this, and wondered what made the army to change this rule, only then did I own up and tell him that I had written to the Prime Minister. From that moment on I didn’t have to be a “secret” club member any more. We had some real Aussie characters in our club, one these was Tom Francis; a cane farmer from Mossman comes to my mind. He was of Irish descent and had a very “short fuse” and a bad temper. When he missed the bulls-eye a few times he was likely to get up and throw his 303 rifle as far as he could into the scrub, often before he had fired off all the allocated rounds of ammunition. He blamed his rifle for getting bad scores. Tom’s son-in-law, who was our target marker for the rifle club, told us the following. On one occasion, when Tom was trying to make two identical rings for a farm implement on his blacksmith forge, he couldn't make the second ring exactly like the first. After persevering for a short while, unsuccessfully, his short fuse reached the end and he threw the red-hot iron ring through the wall opening into the adjacent cane paddock. It resulted in nine hundred tons of sugar cane burning down. Luckily it was in the middle of the cane season and the cane could be harvested. On another occasion, Tom was happily driving a tractor, ploughing a paddock, when the rear tyre burst. Tom was so enraged that he jumped off the tractor and bit the tyre. And, here is another anecdote from my time in Mossman. Karola’s Brother, Walter, had migrated to Australia and lived with us in Mossman. He had only been here for a week and he didn’t speak a word of English. I took him along for the Sunday shoot at the Mossman rifle range and introduced him to the members. After the shoot we went for a beer to one of the Mossman pubs. Somebody was telling a joke, which wasn’t particularly funny, but everybody had a bit of a laugh, with the exception of Walter. “Please, tell Walter the joke so that he can also have a laugh,” Norm Downs said to me. I explained to them that this joke cannot be translated as it contains Australian idiom and vernacular and wouldn’t make any sense nor be funny in German. But they wouldn’t have any of this and kept persisting that I tell Walter this joke. Walter wanted to know what was said and I said the following to him. “These guys want me to tell you this joke, which, by the way is not very funny nor can it be translated and make any sense, but as soon as I finish talking to you, please laugh like hell.” Walter found that very funny and burst out laughing – and everybody was happy that Walter found the joke funny. Ah, those were the good old days. Try getting a politician to respond so quickly and so favourably these days! But don't hold your breath!